With the word Modern in their name, Sala Modern Thai had me wondering what would be the evolutionary steps in their dishes. Perhaps they’d replace the traditional rice noodles in pad Thai with fresh made pasta? Maybe the menu would incorporate some sort of fusion concept mixing Thai cuisine with other countries? Turns out, neither seemed true; their dishes were the staples gracing the Toronto Thai restaurant menus for years. In fact, if anything, they even incorporated further elements of traditional Thai touches like with their Bangkok pad Thai. 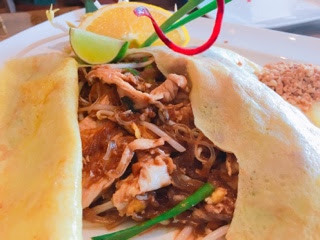 When my husband did an ex-pat stint in China, one of his favourite restaurants was owned by a Thai couple who made the “best pad Thai”, in his opinion. 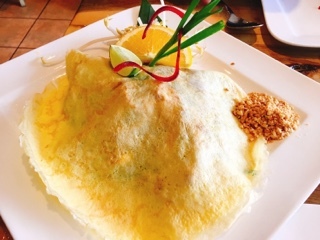 He fondly remembered the thin omelette that encapsulated the noodles, a dish he never found in Toronto until seeing a picture of Sala Modern Thai – really the sole catalyst for our visit. The chicken version ($13) arrives covered in a thin crepe that’s more flour than egg; upon breaking through you’re greeted with a pad Thai made from chewy vermicelli noodles (as opposed to the typical thin rice noodles) and a sweet and sour sauce that’s one of the best I’ve heard had – it’s not overwhelming sweet or sour and there’s no tell-tale hint of red indicating ketchup was used in lieu of tamarind. 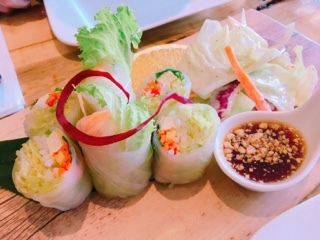 True to their name, the fresh rolls ($6) are made-to-order as the rice paper is soft, chewy, and lightly warmed. With a simple vegetable and tofu stuffing, you get the contrasting textures of crunchy and soft ingredients, with the Thai basil adding a refreshing essence. On the side, a sweet chili tamarind dipping sauce and a small salad of lettuce tossed in, of all things, ranch dressing. Although I’d never volunteer to try suicide wings, I’m also not a wuss when it comes to chili heat. Hence, we opted for the “spicy” version (one step down from “Thai spicy”) of the kuaytiaw tom yum with chicken ($11.50). Wow, what a humbling experience! 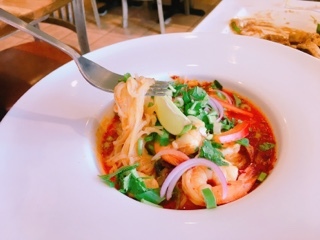 There was such a kick to the tom yum broth, even with the rice noodles, that every second bite had me reaching for a cooling drink. The broth is rich and thick, filled with lemon grass and a shrimp flavours (aside from all the chili). I do wish they used a bigger bowl as ours was so packed with noodles that the soup became more of a sauce than something you can spoon and actually drink. If you’re going to try anything spicy, do yourself a favour and order one of their iced teas. 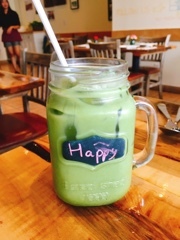 The Thai matcha iced green tea ($5) is the traditional milk-based tea with a strong matcha essence added to make it less sweet and milky. As an aside, Sala needs to do a better job at ensuring their pricing matches up, this one item was listed differently on three places: menu at restaurant ($4), actual charge on bill ($5), and menu on their website ($6). Sala Modern Thai’s beef khao soi ($13) is fantastic. Normally, the coconut milk mixed into the yellow curry broth is a tad strong for me, at Sala it’s balanced so the broth stays savoury while still feeling thick and rich. 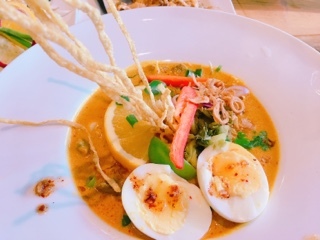 The soup sticks wonderfully to all the crevices of the flat egg noodles and the crispy noodles add a bit of crunch against the otherwise soft dish. 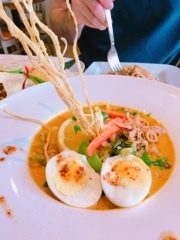 Only two things could be improved with the khao soi: firstly, the beef was overcooked and tasteless (tofu may be a better protein); and the so called “soft” boiled egg arrived hard boiled and dry. So what exactly is modern Thai? Interested, I turned to the internet and found a Paste Bangkok post, where Chef Jason Bailey explains that modern Thai is not only about using non-traditional ingredients but also incorporating cooking equipment that differs from the traditional coals and wok (such as an oven or slow cooker). The dishes must also have intense flavours where you really get a punch of hot, sour, sweet, savoury, or bitterness. So as it turns out, maybe all along, I’ve already been eating modern Thai.